Porto Alegre is the tenth largest city by population, in sunny Brazil. Its inhabitants are a million and half people, but with the metropolitan areas the figure rises to 4 million people. You would hardly be surprised that the Brazilian city is most often associated with football, women and nightlife. Porto Alegre is the birthplace of the famous Ronaldinho, home to hundreds of thousands of hot ladies, considered by many to be the most beautiful in Brazil. The city boasts numerous bars, restaurants and famous clubs. Often compared to New York, Porto Alegre never sleeps. Here the scale is smaller, but at the expense of that, there is emotion that marks much higher degrees. The city is truly unique. It cannot be compared with either Rio or Sao Paulo. Porto Alegre is located on the eastern shore of Guaiba Lake, where five rivers meet. These geographic features suggest development of a diverse ecosystem in the archipelago, giving life to hundreds of species. In watersheds, tourists have the opportunity to travel by boat. In modern urban areas around the local river solid rise office buildings, giving the appearance of the modern Brazilian city. Great views of the city open from the Azoreans Square. It is situated in a very busy place, but the biggest attraction of the square is a huge art sculpture, Monumento aos Açorianos, erected in honor of the Azores - people who created and popularized the Brazilian city. It is with this monument that Porto Alegre is most often associated. Surrounded by large residential and commercial buildings is the notable Methodist Church. Of interest for tourists are the beautiful buildings of the state's House Public Library, Sao Pedro Theatre, the magnificent building of the City, the Museum of Art and the House of Mário Quintana. The public market of Porto Alegre is also one of historically significant sites in the Brazilian city. There, guests and city residents can find everything. In the southeast of Porto Alegre is located Parque da Redencao – a green area with numerous places to relax. Every Sunday, this is the place they conduct the fair Brique da Redencao. Among the sights the city is the great Memorial of Porto Alegre. There can be seen over 100 species. In the park is the Museum of Natural Sciences, which also impresses visitors with its rare collection of fossils, telling about the development of life on Earth. The food of Porto Alegre is exotic and enticing. You must try the traditional dish churrasco, and sip chimarrão. Porto Alegre is the capital of the Brazilian state Rio Grande do Sul. The South American city is among the most advanced culturally, economically and politically in the country places. Many guests of the city believe that the local culture and temperament are rather like the representatives of Argentina and Uruguay, of course, when it comes to football. The Brazilian state of Rio Grande do Sul borders with both of those South American countries. Porto Alegre is one of the richest cities in Latin America. The population of the metropolis is a rich mix of different cultures and nationalities from Portugal, Germany, Italy, Spain and Poland. 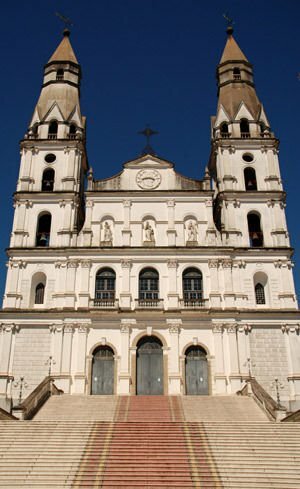 The city also has large communities of Jews, Arabs and Afro-Brazilians. In translation the name of the city means "port of the Sun" or "City of Smiles". Near the Brazilian Porto Algre is another interesting city - Novo Hamburgo.